Should the “Special Relationship” end? 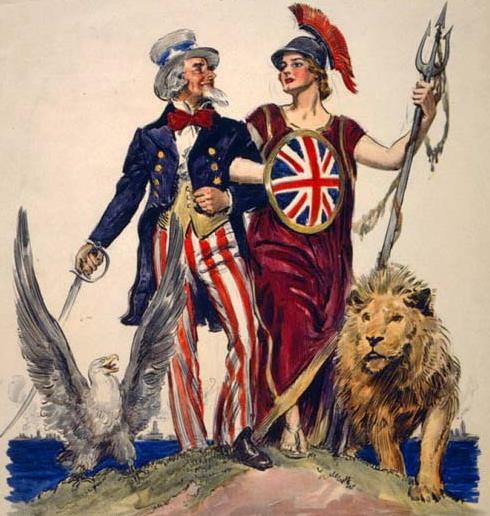 The “Special Relationship” between the United States and Great Britain has coloured the complexion of both countries international political philosophy for the last 150 years. Indeed over the century it has been difficult to note an incident in international politics where the United States and Great Britain have not been involved as a partnership. To understand why it should end we should first look at what it offers. The mutual defence thing is the most obvious thing which springs to mind, our friendship with the US grants us the protection of knowing that should anyone attack us, they will also be attacking the US. It has added weight to Britain’s standing in the world, which has been on the decline since the end of the Second World War. But this sort of relationship goes both ways and co-operation with our friends across the pond has led us to pursue policies of questionable legality and has pushed us into unnecessary and unpopular wars. The UK has blinded itself in making maintaining this relationship its number one priority, it has failed to consider the pitfalls of pursuing such a policy. A prominent example of this being our entry into the second gulf war which, while largely opposed by the British Parliament was vehemently pursued by Prime Minister Tony Blair to the point where prominent members of parliament were resigning in protest. It also prompted the death of Dr David Kelly under suspicious circumstances. Ultimately the naysayers were proved right when no evidence of any weapons of mass destruction was found after the invasion but the reputational damage to the UK is still being felt in the political sphere today. Maintaining the special relationship with the US has led to a rift between the UK and our colleagues in the European Union. Countries which were traditionally our allies, like France and Germany are now more likely to oppose us than support us. It has also led to a breakdown in diplomatic relations between the UK and the Russian Republic, one of the powers most likely to square up to the US in a fight. Our relationship with the US offers us industrial advantages that would not otherwise be available to Britain on its own. The United States is the UK’s single largest export market buying £57 billion pounds worth of UK goods. Also the UK is the largest direct investor in the United States. British companies have more offices in the US than most of the other countries in the world. But any industrial and fiscal relationship is likely to be a double edged sword, as proven by the crash of 2009-10. Direct investment by the UK in the US, which at the time was experiencing a sub-prime mortgage crisis due to its own dependence on Chinese money, proved costly and drove the UK into a debt spiral to which it has only recently emerged from. We cannot mention British industries operating in the US without mentioning the BP Deepwater Horizon disaster in the Gulf of Mexico. This disaster and the subsequent economic and ecological fallout has led to BP being banned from doing any more business with the US government for the immediate future. The special relationship has been tainted, much like the seas around the Gulf of Mexico. What would ending the special relationship mean for the UK? The first thing it would mean would be a severe decline in exports and consequently its economy. Current austerity measures being pursued by this government would have to change to accommodate longer timescales to reduce the national deficit. Also British companies would lose their edge over their counterparts in Europe and Asia when dealing with the US. Direct investment in the US could not continue under this and the UK would have to liquidate its assets or sell those investments to a competing world power such as China or Russia. Loans made to the UK by the US would be called in and would have to be paid. But in any divorce there are always positives, a UK economy which is less dependent on exportation to the US would not suffer when US demand for goods and services decreases, as experienced in an economic recession. UK companies, free of the shackles of co-operation with the US could look for more lucrative opportunities in other foreign markets. Militarily, the benefits of ceasing our relationship with the US are harder to quantify, indeed the prospect of not having the US to call upon when fighting a war would mean a greater cost in manpower and equipment to the UK. We would lose our protection as it were. But at the same time we would gain the freedom of not having to fight wars that only the US wants to fight. Seeing this to its logical conclusion if the US is eventually brought down by a competing superpower like Russia or China, its fate would be its own. We would not be tied to them and would be a degree safer. Clandestine military cooperation between our security services, which has often led to the aforementioned questionable legalities would cease and the surveillance culture which has permeated this over the last 10 years would have to change to suit. The government of the UK can return to the rule of acceptability and accountability, a rule which the US has chosen to ignore when it wants to. Diplomatically, the UK would enjoy a better relationship with the EU and other world powers as it has often in the past been hamstrung by its work with the US. We could mediate political and economic disputes on our own. Indeed it has the potential to move us into a more positive light with our international colleagues. Perceptually, the UK would be seen as a nation of change, willing to end relationships that do not benefit it. It would grow stronger. So, after all the issues are considered is it worth it? It is a tense issue and the benefits of ending the relationship, while easy to see are not certainties. Positives can very easily turn into negatives. In the opinion of this writer, it would take a British politician of great courage and a Britain which is arguably greater than it currently is to undertake such a bold strategy. Is IS actually a fascist organisation?